Last weekend was Anime St. Louis. I got to test the Gacha machine and the new products were a big hit. I'd like to thank all my readers who stopped by, new readers who found my comic, and my friends for keeping things interesting during downtime. It's a great feeling to hear you guys appreciate this comic. One interesting phenomena I noticed at this convention were the free hugs people. This is nothing new, I see them at every convention. But at this convention they were frequently found in a big swarm around the bathroom. We had a bit of debate on whether this was a coincidence, or a strategy to ensnare victims. I haven't linked to Dorkly in a while, so if you missed it, here's some Pokemon, DuckTales, and some more Pokemon! 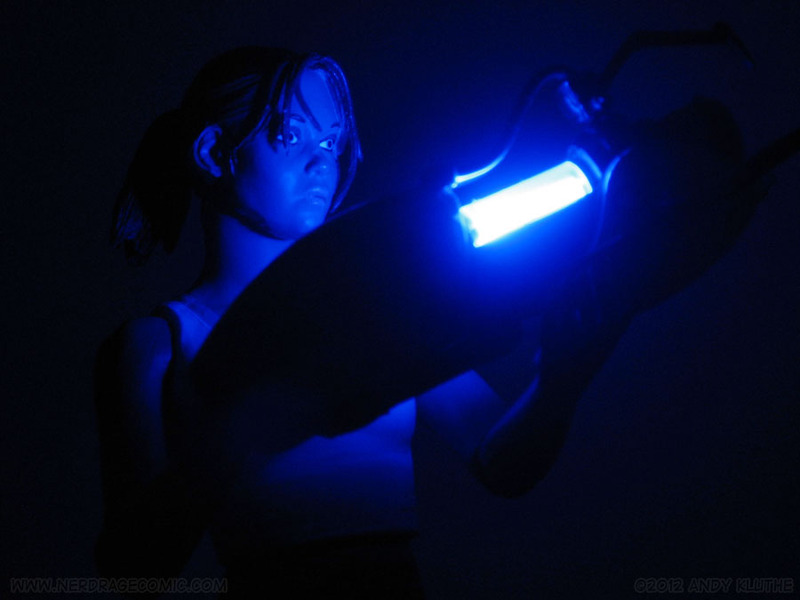 Be sure to check below for a review of NECA Chell from Portal 2! This review comes out of nowhere and also shouldn't be too terribly long. I've reviewed some of NECA's stuff before and own quite a few figures from them (also a life-size plastic quantum tunneling device). 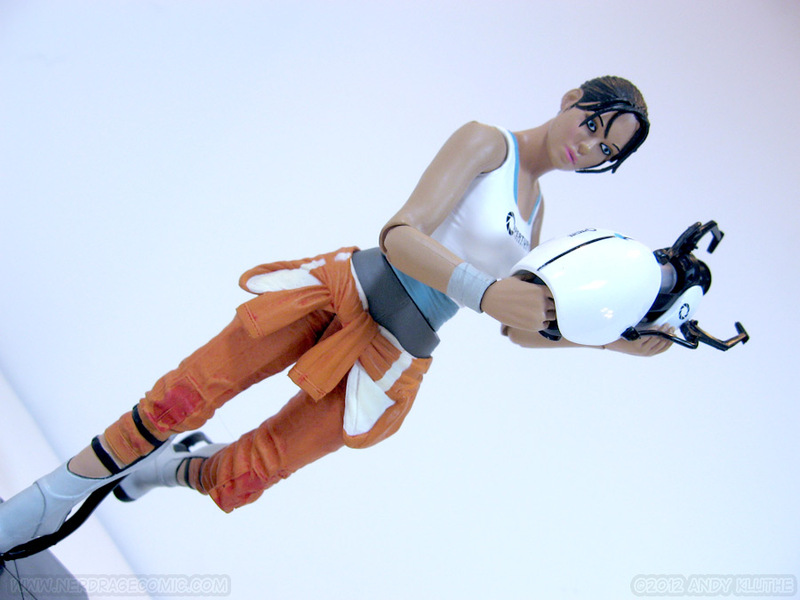 Since my Toys R Us never got Gordon Freeman I snatched up a Chell as soon as I saw her hit the shelves. 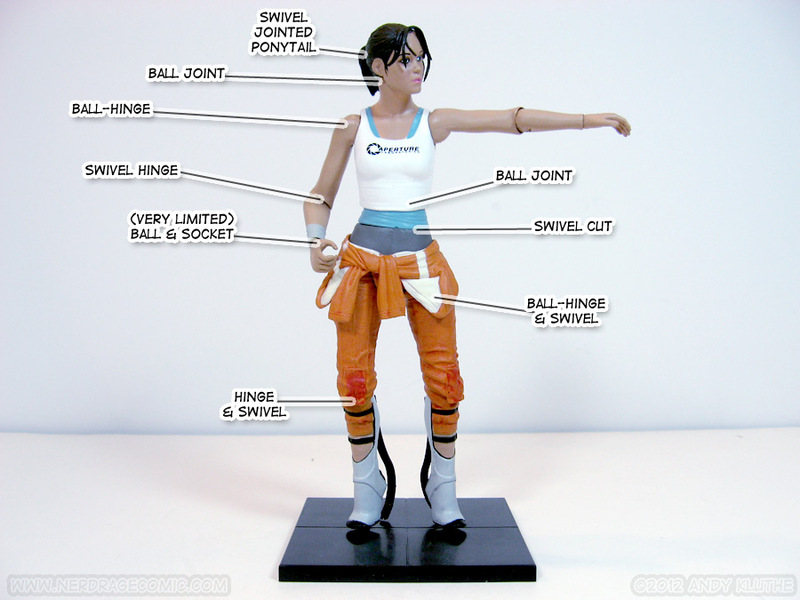 If you're not familiar with Chell, leave now. 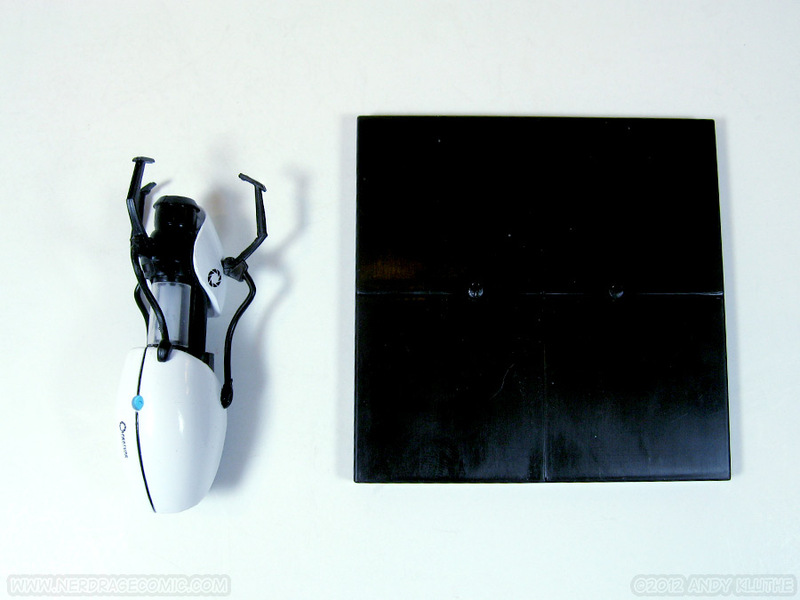 Go play Portal. Then play Portal 2. All done? Good, now you can continue reading. NECA obviously puts a lot of care into these things. Even the little character profile on the back is written in the cheeky Portal-style. They ruin this effort, though, by packing all their figures in a hellish plastic clamshell. This isn't a complaint about this specific product so much as it's a complaint about the brand: you always need scissors to open these. There's no way this box will look nice by the time you've torn the plastic tidbits out of it. I'm not an in-box collector, but it seems a shame they put so much effort into making the package look nice when you're going to ruin it getting the product out. Articulation seems to be an afterthought in this figure. She looks really good in one pose (standing with the Portal gun in her hands), and looks regular-good in maybe a handful of other fairly-neutral poses. I greatly appreciate NECA's efforts in moving away from action statues, but it seems their design method involves designing the character then adding as many joints as possible in the hope some of them will work out. The ball joints on her hips are basically useless thanks to the unzipped jumpsuit around her waist. I'll give them credit for making the folded material out of a rubber material instead of a solid sculpt, though. Because there's no complex shoulder assembly or double jointed elbows, expect to only get basic two-handed stances with the gun. 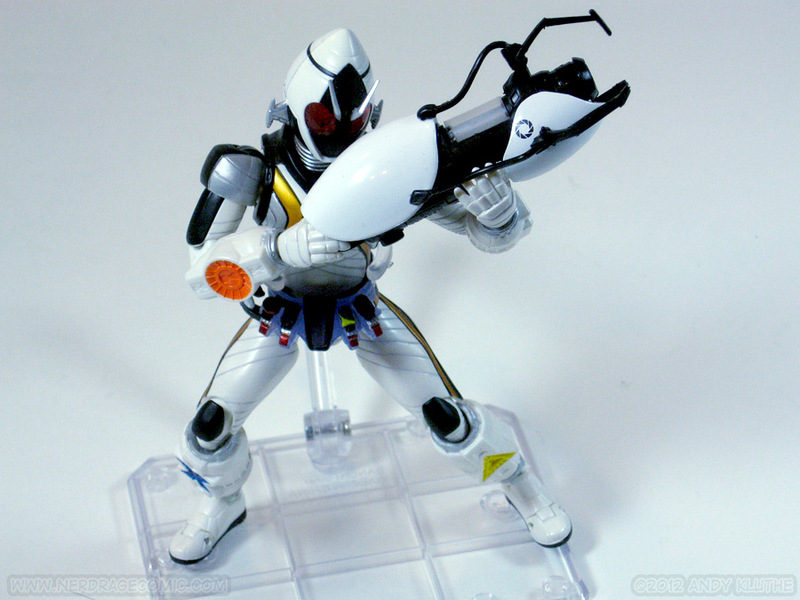 And don't expect to get any one handed-stances with the gun, because it's a two-handed weapon--er, scientific tool. **EDIT: I found (after writing this review and taking photos) that my Chell's hipjoints were locked up and had more motion than I originally thought. She seems to have a hinged ball joint attached to a swiveling post, but that swivel is too tight to turn in my figure (or maybe it's not supposed to). With the hinge freed up, you can get some decent side to side motion, but I think the sculpt is still going to prevent much in the way of back-and-forward movement. You'll probably want to buy Cell in person to make sure her eyes are aligned, because she's just big enough (and there's just enough error) that it's noticeable some of them came out kinda wall-eyed. The paint apps seem generally on the mark. Besides the eyes, she has a little paint slop in her bangs which I'm assuming is supposed to be hair stuck to her face (and not misplaced brown paint). Either way, it reads as hair from a normal viewing distance. Her boots and other distinct parts are all their appropriate colors. She does has some light shading to the folds of her jumpsuit (which they bothered to sculpt with a fine textile pattern, versus the smoothness of her undershirt, boots, or skin.) As mentioned above, the jumpsuit tied around her waist is sculpted out of a rubbery material to provide flexibility. 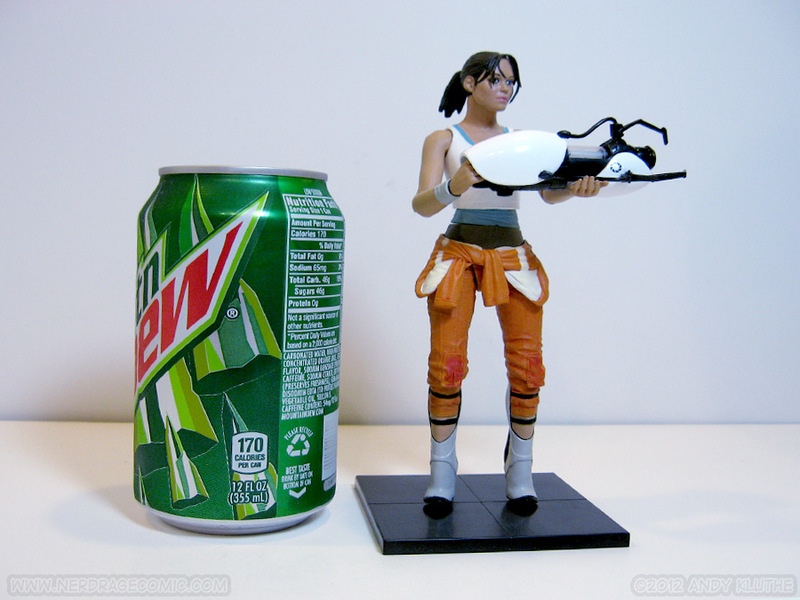 Chell is close to 7 inches tall (NECA's usual scale), and is slightly taller when on her stand. This is easily the best part of the figure. 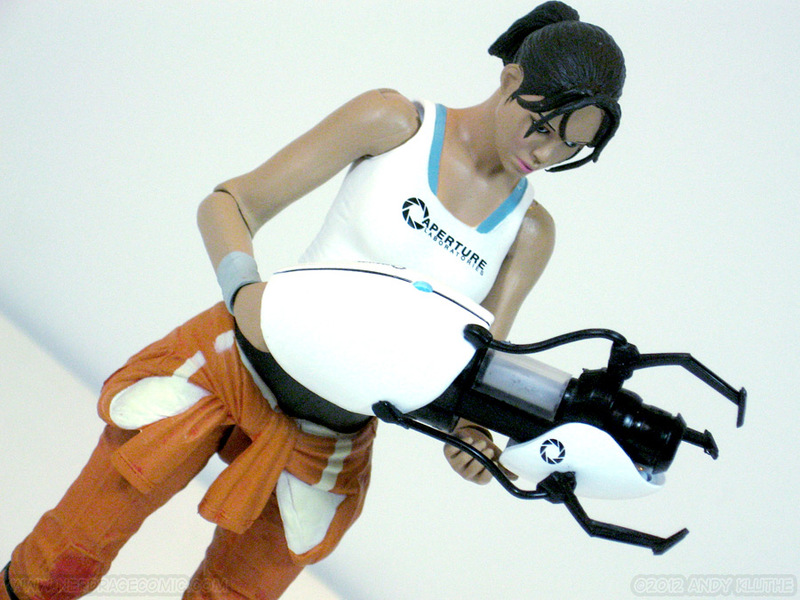 Chell comes with a scale version of the iconic portal gun (the one part of her person you spend most of the game staring at). It's a faithful recreation of the monochromatic device and – thanks to a tiny button on the bottom – you can toggle some LEDs to light the gun up. Even the tiny Aperture logos have been recreated. NECA has also graciously included a stand molded like some of the test-chamber paneling. Despite coming equipped with boots designed to help her survive long drops, Chell can barely handle the basics of standing unassisted (you drunk.) But in all seriousness, Chell is a character with small feet and science-fiction-high-heels, and will naturally face balance issues. The stand is a welcome addition – NECA, please do more of this in the future. •Valve is licensing their stuff for action figures and they aren't crappy wannabe-Mego dolls. 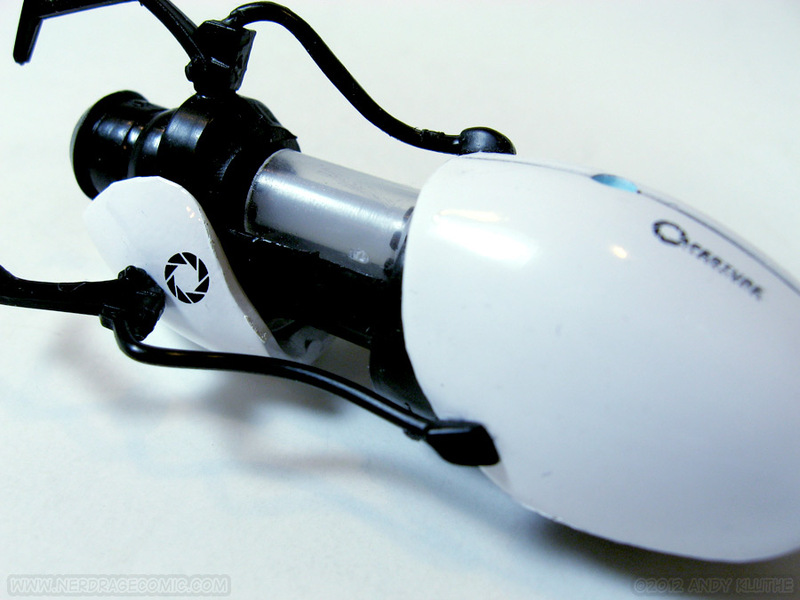 •If you only wanted a $25, 6-to-7-inch-scale light up portal gun it's a great deal. •Articulation feels more like an afterthought, some joints are all but useless. 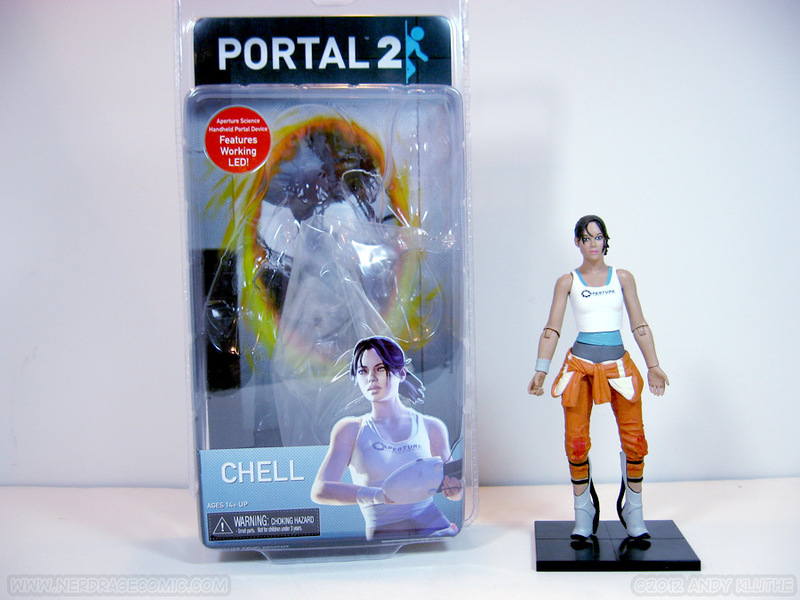 •Possibility of getting a cross-eyed Chell due to paint application. •This disgusting, overweight, orphan probably has no friends. I like Portal. I like Valve. I (mostly) like NECA – their heart is in the right place and they are working hard to make their products better and better. 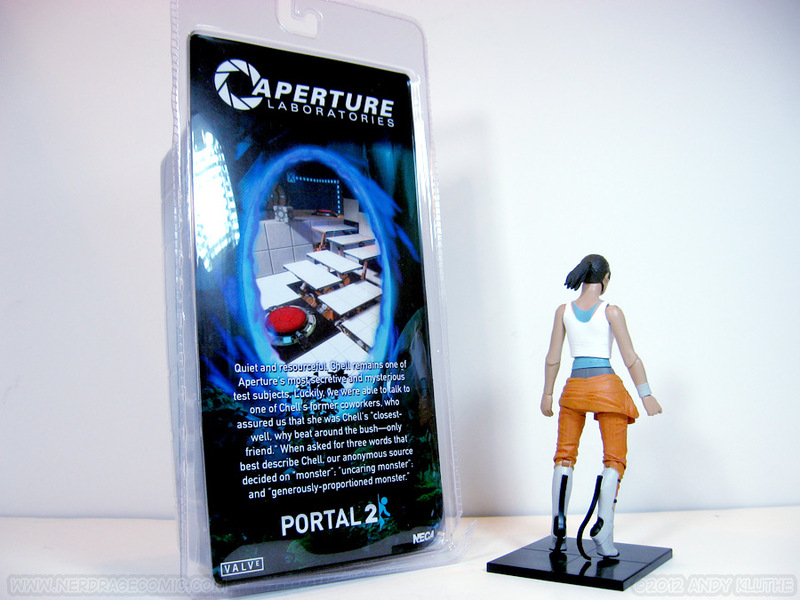 If you're just gonna plunk Chell on your shelf of Portal-and-Portal-Accessories, the articulation was probably never going to bother you. If you were looking for a super-articulated figure, this probably isn't for you. 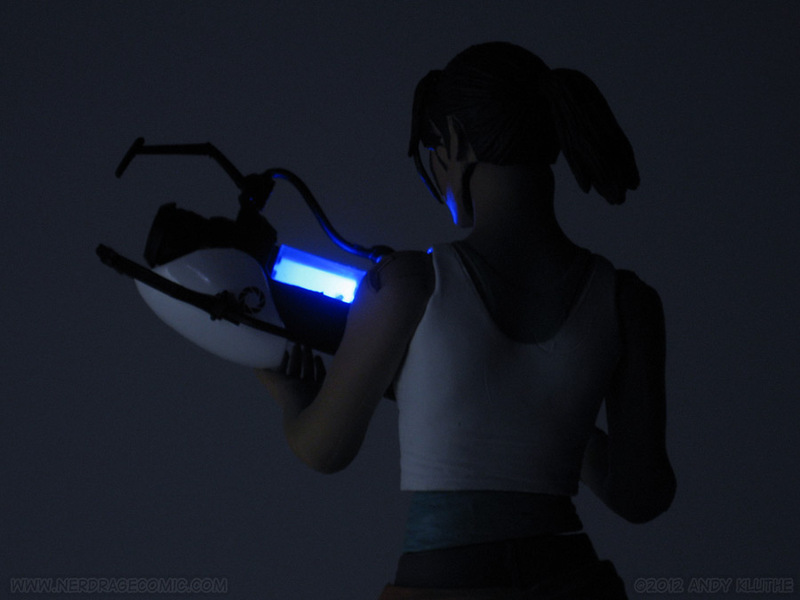 On the other hand, if you're looking to buy a light-up 7-inch scale portal gun that happens to come with a Chell, you're part of a narrow market I can't recommend this to more. My Chell came from a Toys R Us. You can grab your own little test subject for $22.99.